In the News & Notes segment, host Derek Simon discusses the top stories in the Sport of Kings, including a new claiming rule in New York and a tragic confrontation between Steve Coburn, part-owner of California Chrome, and some members of the Breeders’ Cup media. In the U. of Bet / History segment, Derek discusses a great piece by Patrick Cummings regarding the way races are timed in the U.S.
Lastly, in the Handicapping segment, the Breeders’ Cup Classic is analyzed. Host Derek Simon recaps "Super Saturday" and offers a bevy of Breeders' Cup stats sure to cure insomnia. * What BC race best suits Bayern? * Which sophomore star fits the profile of a Breeders' Cup Classic winner: California Chrome, Shared Belief or Tonalist? * Is the great Untapable back? * Did Beholder do enough in the Zenyatta to make her the Distaff favorite? * How do Belmont shippers do in BC races at Santa Anita? These questions -- and more -- will be answered... maybe not well, but they will be answered. Then, he takes up the bizarre tale of a feud between a supermodel and a onetime super horse, California Chrome. Lastly, in an elongated Handicapping segment, Derek previews “Super Saturday,” as well as some other races being run on Friday. Host Derek Simon discusses the announced closing of Suffolk Downs after 79 years of hosting thoroughbred racing, relating it to the closing of Longacres Park in 1992. In the I Need to Know segment, Derek explains how handicapping dogma keeps many players in the pari-mutuel dog house. And, lastly, in the Handicapping segment, he offers a potential play from Suffolk Downs (it seemed appropriate) and looks ahead to this weekend’s big races at Parx. September’s stay in Canada ensues as Mohawk stays the center of attraction with the sport’s top events of the week. Frosh trotters of both sexes, many stars of the season, including glamour-boy-and-girl trotters from the Hambletonian Trail, are the focus of the Saturday, Sept. 13 program. Freshman colt-and-filly-pacer battles will also be covered on our exclusive blog, this year’s Breeders Crown Countdown, including the Reynolds Stakes from Tioga Downs’ penultimate program of this meet. Also, the Milton Stakes elims at Mohawk add to the content. We link to the “Countdown” blog from this main blog for coverage of races through the rest of the season leading to the championship events in November, in cooperation with the Hambletonian Society and TwinSpires. And a special, added attraction to our weekly blogs goes into play with Little Brown Jug week and all the weekday action starting Monday, Sept. 15. Look here and watch the TwinSpires Facebook page and Twitter feed to be on top of some hot contenders during the week that ends after Thursday, Sept. 18, with America’s Pace, the Little Brown Jug. The $682,000 Canadian Trotting Classic (CTC) headlines Saturday, Sept. 13, at Mohawk Racetrack. As has been the case all season with the glamour-boy trotters, a major stakes field is highlighted by the Jimmy Takter-trained duo of Father Patrick and Trixton. We all know that what happened to Father Patrick in the Hambletonian was a striking misfortune and that his stable mate, Trixton, took advantage of it to win. Then Father Patrick returned and was nipped by Datsyuk for his only two losses of the season. He regained dominance by winning the Zweig and Pennsylvania Sires Stakes Championship just like the Father Patrick that would have won the Hambletonian. It is important to pay attention to Takter, who wrote the following tweet recently: “Father Patrick, so special, just makes it look so easy, my best horse ever.” So go no further with your CTC handicapping—Father Patrick is still the best this division has seen in a long time. As well, he is undefeated in three starts at Mohawk. If Trixton is looking to defeat his stable mate once again in a rich stakes event he will have to pray that Father Patrick is a victim of circumstance again. Even though Trixton has had success at Mohawk this season and holds the Mohawk track record for a three-year-old trotter (1:51.3), he has to beat Father Patrick fair and square once to prove he is near as good. Local standout Harper Blue Chip has dominated the Ontario Sires Stakes circuit this season and finished third in the Hambletonian, though he was far back from Trixton and Nuncio. “Harper” is definitely an exotic wagering element. The other four are E L Titan, Muscle Matters, Il Sogno Dream and Damfoolrmillionair, minor to no threats. The $409,000 Elegantimage Stakes, which used to be contested in June, is also on the Sept. 13 program at Mohawk, featuring 11 of the best soph-trotting fillies. Takter sends out the favorite in this event, too. Certainly a standout for us during the season, Shake It Cerry trots a mile above this group. Takter also senda out Scream And Shout, yet to be proven worthy of this caliber. Completing the field are Demanding Sam, Tosca, Riveting Rosie, Vanity Matters, Chivaree Hanover, Sweetie Hearts, Muscle Babe, Designed To Be and Ake Svanstedt’s Heavens Door. Since “Designed” is bound to be a second choice, Ake’s “Door” may go off as a good exacta choice and if Designed happens to be beat for third, any of the others will key a great triactor. Two eliminations were raced last Saturday as non-betting events (after being cancelled on Friday due to a lightning storm at Mohawk) deciding the 10 two-year-old colts making up the field of the $390,000 William Wellwood Memorial final. Uncle Lasse, a full brother to Shake It Cerry, won the first. Trained by Takter, Uncle Lasse has won three of six starts and has never been worse than third. The second went to Lookslikeachpndale, a son of Muscle Hill, trained by Luc Blais, in 1:56.2. It was the graduation of maiden to winner for Lookslikeachpndale. Completing the field are Gifted Way, Dont Rush, Aldebaran Eagle, Habitat, Jetpedia, Southwind Stryker, Wheels Ah Smokin and Big Rich. We had Jetpedia last week and he was second in one elim and we had Wheels Ah Smokin in the other where he finished sixth. However, they appear to be strong exacta partners this week for Habitat. Were there wagering, Habitat would have been a huge favorite, so it works out for bettors that there were two other elim winners; now Habitat may be a second or third choice and that is a good thing for a win bet and, as mentioned, to be keyed with the two we supported last week. The $385,000 Peaceful Way Stakes, for two-year-old filly trotters features another standout, a world champion in a group of 10, Mission Brief. The daughter of Muscle Hill won her elimination last week in a world record time of 1:52.1 and has been a sterling model for victory most of the second half of the season for trainer Ron Burke. Driver Yannick Gingras said she hasn’t even given her best yet. “She had plenty left [in last week’s elim], she is scary scary fast,” said Gingras. Jolene Jolene won the other elimination, a daughter of Muscle Hill trained by Jonas Czernyson, in 1:55.1. We supported her as she approached her current form and peaked recently. Jolene Jolene has won three consecutive starts and finished second to Mission Brief on Hambletonian day (we supported that exacta). These two represent the exacta, which will return very little, leaving your judgment as the to-play-or-not-play factor. The New York Sires Stakes (NYSS) Night of Champions at Yonkers is the Saturday, Sept. 13 highlight in the Empire State’s standardbred business and bettors beyond the borders can wager on eight events featuring the best two- and three-year-olds of the 2014 season. Each final is worth $225,000. Races two through nine on the 13-race card ($10,000 guaranteed pool Pick 5, 50-cent base wager races 5 through 9). For the sake of brevity, we will list the final and our two suggested contenders in the order the races appear on the program. On Friday, , Sept. 12, Freehold presents the Charles Smith for $55,000. Once a stable in the Hambletonian Trail stream of races, glamour-boy trotters take to the half-mile in the new millennium with less initiative, as well as less to win from a purse reduced greatly. In any event, this seven-horse field is an opportunity for Well Built to dominate as was once thought he could do this season in the division. He is up against far less than he faced when his gait problem began in May, so it remains to be seen how the public approaches this crew. We would use him as a key if he turns out to the be top choice and use Skates N Plates and Hillustrious with him. The weekend began on Friday, Sept 6 with a lightning storm so intense that Mohawk cancelled its program. With it went the eliminations for the William Wellwood. Those two events were raced on Saturday as non-betting events. The “Wellwood” goes next week. Yes, the harness blog for TwinSpires is still at this location. Make a note that the TwinSpires harness blogs are moving to a new address—the official TwinSpires website; we missed our Sept. 4 deadline, as technical glitches are being worked out. Soon the move will been established. We will guide you to the page from this residence and our personal pages on Twitter and Facebook. The Breeders Crown Countdown blog will stay at its current location and we will be linking to it for coverage of races connected to “Crown” eligibles leading to the championship events in November. Don’t miss one episode and look for archived race reviews at the Hambletonian Society site. This week’s “Countdown” races were at Mohawk for frosh and soph, colt and filly pacers. We had one winner there with The Show Returns ($4.90, $3.30, $2.40), a second with Winds Of Change ($5.80, $3.60; Exacta $14.50), and a third with Shes A Hot Mess ($2.80). It was a big sires stakes finals weekend and our best results came from Northfield, which we displayed as part of the horses-to-watch list (H2W). Of the eight Ohio Sires Stakes finals we nailed four, including, from high price to low (see below for exact pay outs), Honey B, Lofty Chip, Friskie Til Dawn and Crown Time Keeper. We only had a single winner at Hoosier Park’s state-bred parade of finals, with Always B Miki ($2.40, $2.10, $2.10 ok). We were second with Andi’s Alana ($2.20, $2.10) and third with Golden Big Stick ($3.20). We were off the board with the Pocono state-breds on Saturday. On Sunday at Philadelphia we had Father Patrick ($2.40, $2.10, n/s) and second with Limelight Beach ($2.80 n/s Exacta $8.60). The H2W results list across-the-board prices. Also, exactas are included when a H2W horse finishing first or second completes the result with a race favorite or another H2W horse listed in the same race (an asterisk appears when both horses were listed to complete the exacta). 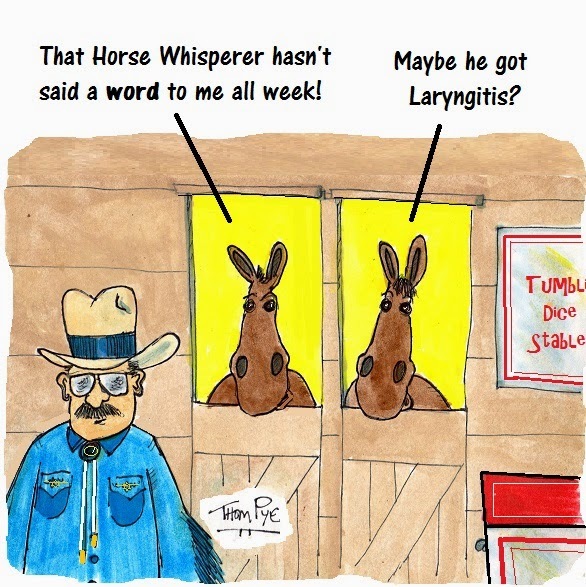 This week, there were 49 active horses on the H2W list. Scioto Downs is still one outpost for our exclusive H2W but the track’s seventh decade in 2010 was a grim shadow of the once lucrative Ohio track. GM of racing Stacy Cahill had said there may be no choice but to close. But by June, 2012 after a racetrack-casino law was passed, Scioto became Ohio’s first “racino.” Cahill said the change met its promise and horsemen are happy. After dropping to $2.39 million in total purses in 2010, Scioto offered $9.89 million in purses during 2014 which more than doubled the $4.73 million at the track in 2012. Before this past weekend’s program, Scioto offered total purses of $11.71 million through 78 programs. Midwest champion trainer Virgil Morgan, Jr. said Scioto is the best it has been. He has stayed, along with other popular horsemen, including Ronnie Wrenn, Jr., Josh Sutton and Aaron Merriman. “The money is unbelievable,” Merriman told the Cleveland Plain Dealer “[Many horsemen] ot racing for [good] money for so long, everybody wants it so bad now. And the horses are so much better.” There are purses and full fields, many with 10 horses. Scioto horses will continue to be monitored and will stay on the H2W list because the racing is great and TwinSpires bettors deserve the best competition possible when playing. When Yonkers Raceway hosts the 25th edition of the New York Night of Champions on Sept. 13, with $1.8 million in purses (eight sire stakes finals for two- and three-year-olds at $225,000 each, the track will offer a $10,000 guaranteed Pick 5 pool. The 50-cent wager includes races 5 through 9. As per existing Pick 5 rules, should no one select all five winners, the entire pool (minus takeout) would carry over to the Sept. 15 card. The next big thing in harness for the season is the Little Brown Jug and the TwinSpires harness social network will be in session all week, from Sept. 14 through “Jug” day, Sept. 18. Look for suggested contenders for many of the great stakes events the Delaware, Ohio meet offers. The track publicity department ranks Mcwicked as the number-one contender, followed by He’s Watching, Somewhere in LA, Sometimes Said, Lyonssomewhere, Limelight Beach, At Press Time, Cammikey, On Golden Ponder and Beat The Drum. Seven of those are Ontario-trained colts. We are keeping a close eye on Limelight Beach’s preps before the Ohio heats. With a new home in the Ron Burke barn and Burke feeling this one is his shot for a Jug, the price may be right, especially against the popular Mcwicked, who doesn’t always live up to his one-dimensional penchant for speed. Continuing our scan on drivers with streaks, we make note that Dave Palone’s seven-win program at the Meadows on Sept. 4 tossed a profit of $10. However, one horse made that possible, an $11.20 winner in Race 6. The next highest price paid by a Palone winner was $7 and the lowest was $2.20. As well, some of his losers in the other seven races in which he participated were big favorites. Palone continues to be a great driver, of course, but he is not a flat-bet profit regardless of his humungous number of career wins. Mohawk shared this weekend’s highlights with Vernon and featured some of the biggest names of the season from divisions young to old. However predictable the outcomes turned out, one surprise stuck out prominently on the Canadian menu. –Please note that this review will not include the Monday, Sept. 1 Cane Pace at Tioga (we will mention that in next week’s review). Make a note—and we will post this news on Thursday, Sept. 4—that the TwinSpires harness blogs are moving to a new address—the official TwinSpires website, hopefully by Sept. 4. As soon as the move has been established (we have to move all of our tech furniture there) we will guide you to the page from this residence and our personal pages on Twitter and Facebook. We were on board for everyone’s choices on Aug. 29 at Vernon when Sebastian K ($2.30, $2.10, $2.10) took the Crawford Farms event; Father Patrick ($2.10 n/p/s) won the Zweig for colts; and Shake It Cerry ($2.40, $2.10, $2.10). won by the Zweig for fillies. On Aug. 30 at Mohawk, more easily forecasted results ensued for the stakes program, with Artspeak easily winning the Metro Pace (our two possible upset candidates were off the board) and our choice, in league with the public, Jk Shesalady ($2.90, $2.50, $2.10), won the She’s A Great Lady Final. The filly we liked third in that race finished third and Shakai Hanover paid a shocking $9.90 for that spot. Amid the clouds of chalk, though, came the latest episode of The Sweet Lou Show and the dramatic twist in this week’s episode was unexpected by all. Finally coming up short, a winded “Lou” was severely pressured in the stretch and faded and 66-1 Modern Legend came from a usually beaten position (in other episodes of the Lou show) to win pacing away. Foiled Again ($8.90, $12.70 ok) managed to hold second. We heard from sources that Lou was “not himself” due to an alleged “bug” going around the Burke barn. We could not confirm that as fact, though our source was reputable. Modern Legend has raced consistently with the same horses and has never gotten close to Lou but for passing tired ones and it seems that is what happened in this race. Foiled Again, of course, is an in-and-out competitor that causes no surprises when, after a few dull races, he wakes up to be a force in the mix. But Modern Legend took advantage of a steaming pace (1:20.1 for Lou at three-quarters) and a possibly ill super-horse. Time will testify to all of this. The H2W results list across-the-board prices. Also, exactas are included when a H2W horse finishing first or second completes the result with a race favorite or another H2W horse listed in the same race (an asterisk appears when both horses were listed to complete the exacta). This week, there were 30 active horses on the H2W list. Colonial Downs looks ahead to its 17th season of pari-mutuel harness racing, starting Sept.17 and continuing with a six-week fall campaign thru Oct. 26. This is the only one-turn mile track in harness racing and it offers handicappers and bettors great opportunities for all types of wagers. The action will take place every Wednesday, Thursday, Saturday and Sunday at 1 p.m. The highlighted program of the meet is the annual $350,000 (est.) Virginia Harness Day of Champions on closing day, when Virginia-bred frosh and sophs of both sexes compete in eight championship races. The Colonial Downs stable area opens Sept. 10 and training begins the following morning. The first qualifying races are Saturday Sept. 13 at 1 p.m. and the opening day draw will be held that morning. A total of eight late-closer stakes series have also been announced and nominations are currently being accepted. The slate of pacing only stakes includes the Horace Martin Memorial, VHHA and the U Gotta Win One Now series events. Trotting only stakes include the Parkers’ Memorial and the We Redeem Our Fallen Soldiers. The Good Ole USA, Juniors and Delmarva series all feature separate pacing and trotting divisional legs. The Little Brown Jug conditions provide that if not eligible, the winner of the North America Cup, Meadowlands Pace, Cane Pace and Messenger could be supplemented. Driver Matt Kakaley, who drives All Bets Off, expressed disappointment that his colt was being considered for the Jug. “I wish he was [Jug eligible] as he gets around a half great,” said Kakaley, who disagrees with Burke. “[All Bets Off] won the ‘Rooney’ at Yonkers this year and he did that pretty handily.” The colt also won the Carl Milstein as our choice, at 7-1. August harness racing is about to reach a peak in its finale as the three-day weekend, which unofficially ends the summer season, arrives. The Labor Day holiday does not include harness action around the continent, with Canadian and American stakes events swarming through the daylight and nighttime hours. No division is left un-raced, with an emphasis on the new candidates, as freshman colt pacers are featured in the Metro Pace and frosh fillies in the She’s A Great Lady finals at Mohawk. 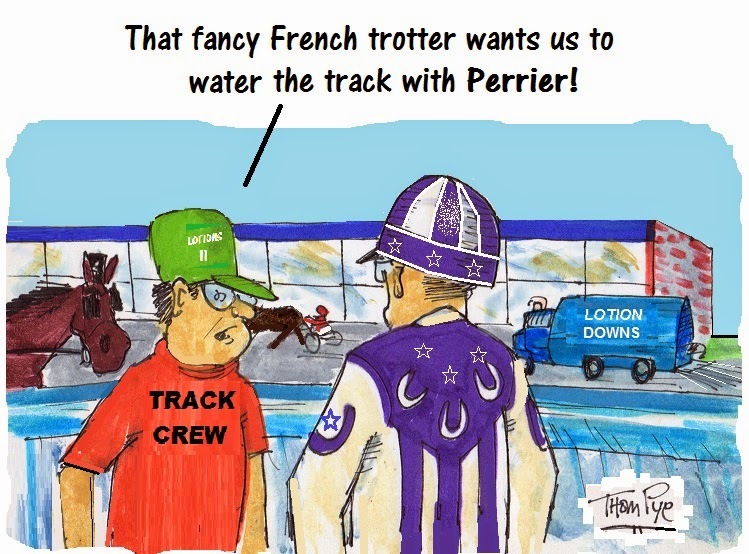 The divisions also contest lucrative Champlain and Simcoe stakes and “The Sweet Lou Show,” for the older pacers, is on the program, too—this week’s episode is titled the Canadian Pacing Derby Final. Glamour boys and gals on the trotting side are featured at Vernon in “Zweig” splits and on the pacing side there is Labor Day’s traditional Cane Pace and those aren’t even all of the features. On the same program, Sebastian K takes on his usual and some new challengers in the six-digit Crawford Farms mile. So load your TwinSpires account and charge your devices between meals, snacks and relaxation while picking and choosing your moves. Our suggestions follow here and on our exclusive blog, this year’s Breeders Crown Countdown, now on line. We link to it from this main blog for coverage of races through the rest of the season leading to the championship events in November, in cooperation with the Hambletonian Society and TwinSpires. The $667,000 Metro Pace Final for frosh-colt pacers has been upset territory over the years as well as some deserved public choices have taken the honors. We know this because our win record for this race over the last decade has included choosing both pay types. On Aug. 30, the obvious may rule in Artspeak, a first-season colt that races like a veteran. As well, the streaking local, Go Daddy Go, who won the other elim last week, is sharp, though his connections know he must improve here to make a major impression. The contender with the most improvement who could shake “Daddy” from an obvious place finish and, with the help of a speed duel, create an upset shockwave, is Lone Survivor. Trapped and shuffled and returning late with resilience, “Survivor” was as close to beating Daddy as Lyons Levi Lewis in the first elim. The two moves he made may have equaled a win if things went differently but in the final, chasing Artspeak will be the game and if the huge favorite is compromised at all on top, Survivor may indeed be the lone survivor of the field. The $480,000 She’s A Great Lady Final at Mohawk on “Metro” night will feature a sterling favorite and strong leader of this division in Jk Shesalady. Last week’s elim-topper was immaculate and far better than the other two elim winners’ efforts. She should romp again at odds that could eliminate show betting; she is that strong. Solar Sister is an interesting exacta addition and should up the payoff. At 37-1 she had a far more stressful trip against “Jk” than place-finisher Divine Caroline (public’s second choice). The other exactor and triactor companion should be Shakai Hanover, a beaten favorite in her elim. This week, Sweet Lou looks for his 11th-straight win against the toughest, albeit the same, group of older pacers that have followed him in his 10-race win skein as he leads the cast of the $634,000 Canadian Pacing Derby (CPD) on Aug. 30 at Mohawk. Missing this week is Captaintreacherous, whose connections scratched him from the CPD elim due to illness. ”Lou” has major foes in Bettors Edge and Foiled Again, both in this field, but only an unpredictable circumstance would find Lou behind them at the wire. All the others are rungs below Lou, including some of the local favorites that fans have been insisting can beat him. This, however, is not a hockey game, it’s the Sweet Lou Show and he is the best exotic key to come along in a long time. Stay with the program and use the two foes mentioned in criss-crosses for trifectas and in separate exactas, especially if the locals lean on any others. Grand Circuit events at Mohawk for Friday and Satruday, for two-and three-year-olds, the Champlains and Simcoes, are covered this week at the Breeders Crown Countdown blog. The colts for the $340,000 Zweig Memorial on Friday, Aug. 29 at Vernon Downs, are familiar and talented and, for all due purposes, still led by the best—Father Patrick. Unless he scratches between our press time and Aug. 29 for health reasons that help explain his post-Hambletonian loss, there is still no one in this cast, including his stable mate Nuncio, that are better than him on their best day. If his two successive losses cause his win-price offerings to increase, then there is no question he is the key for exotics as well as a win bet (it has been a while since being able to play him straight at prohibitive win odds. A good addition in combo tickets is Martiniwithmuscle. When on gait, this one knows how to float and is getting better as he and the season become older. The $150,000 filly division of the Zweig is a bad race to give up on Shake It Cerry. Even if you feel Lifetime Pursuit has overcome her, that one is absent here and “Cerry” wins this by default. There may be some chances taken on members of this field by bettors but let’s face it, Cerry is tons better than these, including Heaven’s Door, who loomed more of a formidable foe last month than she does now. What we hope is that Broadway Socks, Avalicious and “Door” are the smokescreen that gives us another surprise price on the filly that continues to keep on giving to the bettor when it counts. You go girl. Friday, Aug. 29 at Vernon Downs on the night of the Zweigs, the $236,000 Crawford Farms Open, matches super Sebastian K against Bee A Magician, Market Share, Mister Herbie, Archangel and five others. With two colts coming into the race per $35,000 supplemental fees, there are eight entries in the 2014 Cane Pace field on Sept. 1 at Tioga. For years this was a special event, it being the first jewel in the Pacing Triple Crown (a series with more than three events when you add eliminations). 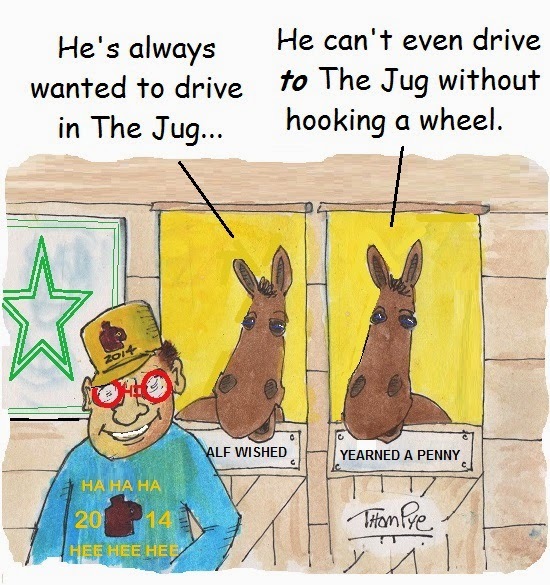 Although there is still a “crown” for winning it, the Little Brown Jug and the Messenger Stakes, there is little for any bettor to be concerned about along the way. Sadly, even the press value of the series has died. However, alive and racing are some of the top soph-colt pacers of the season, including the industry’s anointed Hes Watching. The fast but opportunistic Hes Watching is one of three supplements. He meets major foe Jk Endofanera, the competitive Doo Wop Hanover, improving Lyonssomewhere (supplement), Stevensville (his first nemesis of the season), Luck Be Withyou (supplement), Bushwacker and Beat The Drum. This could very well wind up to be like the North America Cup in a few ways which give Jk Endofanera an edge. The early-speed factor weighs heavily in this mile and Hes Watching may be over-confident after his recent efforts and ready to play his speed card. That will be his Waterloo, since Lyonssomewhere has the natural ability to fire early (though he has the burden of being short late). In the first-quarter you may also see Stevensville hustling for a front spot, as well as Beat The Drum will have a fancy to be up there. The grinding colts with more than a few chances to take advantage of the speed scenario are Doo Wop Hanover and Jk Endofanera, the latter who did just that at 12-1 in the “Cup” with a similar configuration and some of the same horses. As well, “Jk” has once again fallen out of favor to Hes Watching and that is always good for his odds, making them far less than his chances. “Doo Wop” could be a perfect closing companion to complete a surprisingly healthy exacta. TwinSpires' Derek Simon recaps the Travers Stakes and the Pacific Classic and discusses the role of a jockey in the “I Need to Know” segment. In a special “Racing History” segment, all-time greats Round Table, Ribot, John Henry, Sea Bird II, Phar Lap and others face each other in a mythical running of the Breeders’ Cup Turf presented by Brisnet.com and called by track announcer/TV personality Mike Battaglia. With all of the stakes action focused at Mohawk this weekend, we found some fair prices on some obvious contenders that won. Next Saturday’s Mohawk program will present the lucrative finals to the elim events of the past weekend as we see more racing than usual during the U.S. Labor Day holiday weekend. In the Casual Breeze splits on Aug. 22 at Mohawk we were in tune with everyone in one elim with Lifetime Pursuit ($2.90, $2.10, $2.10 ok) and off the board with My Inspiration at 7-1. Aug. 23’s winners were topped by Go Daddy Go ($6, $3.10, $2.50) who offered a generous win price as a second choice in one of two Metro Pace elim splits. We tried to beat the huge favorite, Artspeak, but could not. Sweet Lou ($2.30, $2.10 n/s) easily won his 10th-straight race in a Canadian Pacing Derby elim for all of us. In the second split, our choice scratched (see News and Notes below). Again, the best we could do in the She’s A Great Lady trio of elims was the obvious Jk Shesalady ($2.40, $2.10, $2.10 ok), with our other two choices at 8-1 and 61-1 quite out of the mixes. A fascinating note of cashing on our contenders appears in our horses-to-watch list (H2W). 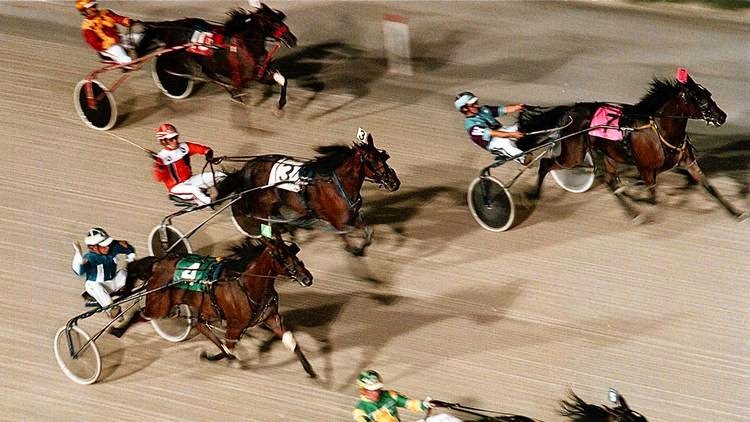 The highest paying winner of the week was at Yonkers; we were following Insane In Spain on Friday night. He went off at 23-1 and shared the win with a huge favorite in a dead heat. The win prices were obviously compromised by the dual victory and instead of paying $48 to win, Insane In Spain paid 9-2 to win and more to place. We did, of course, win both exactas (using the favorite, as we suggest with our H2W choices). We continue this year’s Breeders Crown Countdown blog in our weekly TwinSpires harness previews, linking to it for coverage of races through the rest of the season leading to the championship events in November. Don’t miss one episode and look for archived race reviews at the Hambletonian Society site. Three Ontario-owned three-year-old pacing colts have paid $35,000 supplements to race in the Cane Pace at Tioga Downs on Sept. 1. With them there are only eight colts entered so eliminations will not be required. We will analyze the $437,325 final along with other Labor Day weekend features in our Thursday blog. Another great pacer has passed away. Life Sign, the 1993 Little Brown Jug winner and Hall of Fame member, died in Australia, on Aug.14, at the age of 24. A son of the incomparable Abercrombie and world champion filly Three Diamonds, Life Sign raced only at a two and three, amassing $1.9 million from 18 wins, 10 seconds and five thirds in 35 starts. 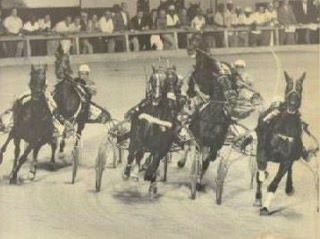 Besides his record-breaking “Jug” success, most memorable for the outside trip on the half-mile in Ohio, he won the three-year-old Breeders Crown, Art Rooney, Governor’s Cup and others. At the stud Life Sign left the winners of more than $113 million in stakes in North America, placing him among the top-10 money-winning sires at his gait. While in Australia his stock earned $12.4 million and in New Zealand they amassed almost $2 million. There is still no word if Father Patrick will race in the “Zweig” at Tioga on Labor Day weekend. The once-immaculate gait of Father Patrick was compromised when he broke at the beginning of the Hambletonian and galloped all the way around. Then he showed up for a Tompkins-Geers and finished second to Datsyuk, just another in the division that could not get to “Patrick” all season. The race was reported as having an “uneventful” start, though Patrick went wide for a spell to take the lead. But he has never been “short,” and struggled to dismiss a challenge late even with difficult starts. All of his is leaving questions about his health and immediate racing plans and unless the Jimmy Takter team releases some information about a problem or Patrick is not scratched from the Zweig, we can only suspect something is amiss. Our continuing look at drivers streaking on programs brings us this week to Aaron Byron, who races at Tioga Downs. On Aug. 22 he won five of his 10 drives and that 50-percent win rate for him translated into profits for those following him with win bets. Wagering solely on the fact that Aaron was driving, it cost a bettor $20 for the evening. Aaron’s winners returned $54.20, a profit of $34.20. TwinSpires' Derek Simon discusses a Paulick Report piece on potential pool manipulation at Thistledown (say that three times fast) and opines on how to determine and capitalize on efficient and inefficient pari-mutuel markets. Lastly, in the handicapping segment, he breaks down Friday's Personal Ensign and Saturday's Travers Stakes at Saratoga Race Course. Despite what various racetrack touts and system peddlers say, one of the things that makes consistently beating the races so tough is that, for the most part, pari-mutuel betting markets are efficient. This means that all the relevant and available information affecting the outcome of a horse race is generally known and accounted for. Hence, the final odds are an accurate reflection of a horse’s chances of winning — minus the track take and breakage, of course. Sure, there are pockets of inefficiency and irrationalism. Scholars have long documented the existence of a “favorite-longshot bias,” whereby shorter-priced horses are slightly underbet and longer-priced horses slightly overbet. However, such inefficiencies are but ripples on the pari-mutuel ocean. Still, the fact that inefficiencies can and do exist provides hope that the races can be beaten — just like grainy, out-of-focus video footage provides hope to some that bigfoot lives among us (often disguised as a broken tree branch). In this article, I will attempt to show readers how they can spot and capitalize on inefficient markets — as well as efficient markets — to make more moolah at the racetrack. John Doe is given $2 to bet to win on any horse running at Saratoga on Saturday. * How does he choose what race to bet? * How does he choose which horse to bet? Well, assuming Mr. Doe is logical, one would expect him to play the race and horse that (he believes) give him the best chance of winning. However, even if Doe possessed the superior handicapping acumen of a dart-throwing monkey or one of those omnipotent racetrack touts mentioned earlier, it is clear that any market comprised solely of his wager would have to be inefficient. For, even if we ignored the fact that Doe’s horse would be 1-9, we are stuck with the unfortunate detail that all the other horses in the field — those that didn’t receive any of Doe’s dough — would be lumped together at 99-1. Obviously, this is not an accurate assessment of each horse’s chances. Thus, even though this was an extreme example, it should be self-evident that less money and fewer wagers equal a less efficient market. Might the opposite also be true? Does more money and more wagers lead to a more efficient market? In races featuring above-average betting action, favorites won 38.6 percent of the time, lost just 13 cents per dollar wagered (compared to 16 cents for favorites overall) and had an impact value (IV) of 3.35 (versus 2.80 for favorites on the whole). Now, I know what some of you are thinking: big deal, Derek, your “fantastic figures” still produced a loss of 13 percent. 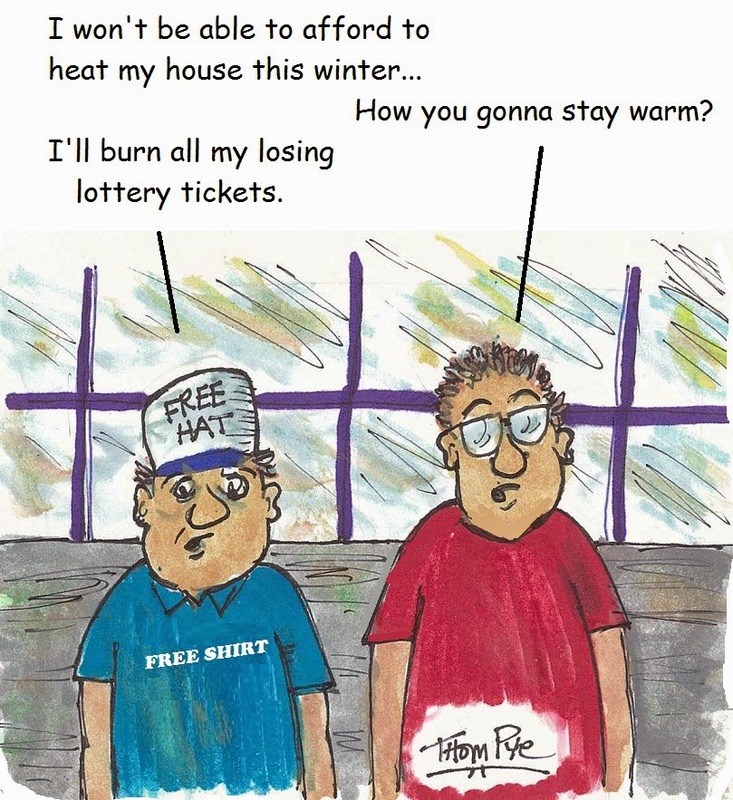 What good does it do to identify efficient and/or inefficient pari-mutuel markets if one still loses one’s shirt? Keep your chin up, Daniel-san. It’s not so much what the stats tell us about these specific instances, it’s what they imply about handicapping in general. Let’s go back to the definition of market efficiency: all the relevant and available information affecting the outcome of a horse race is generally known and accounted for. To me, this suggests that “all the relevant and available information affecting the outcome of a horse race” may be overvalued or undervalued in races attracting more or less wagering dollars, respectively. In other words, rather than patterning one’s handicapping around specific race conditions — placing extra value on workouts in two-year-old races, stressing class in turf races, etc. — a player might be better served by using the straight wagering pools to emphasize or de-emphasize traditional factors. In races with less than $25,000 in the win, place and show pools, the horse(s) with the top last-race speed figure produced a loss of just eight cents on the dollar — nearly half the loss produced in races with higher pool totals. Get the point? By gauging the relative efficiency of the market one is betting into — be it the first race at Arapahoe Park or the feature race at Del Mar — my research suggests that well-known predictive factors like speed and class can be upgraded or downgraded accordingly. And that, my friends, is what good handicapping is all about.